Malvern, England comprises a number of townships or villages centred around the Malvern Hills. 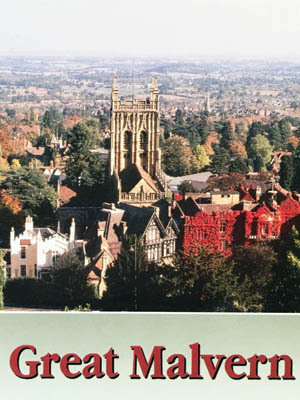 Great Malvern is the main town and then there is West Malvern, Malvern Link, Malvern Wells, North Malvern and Little Malvern. All come under the jurisdiction of Malvern Hills District Council with the various localities having their own Parish Councils underpinning the District Council. The Business Park is the main out of town shopping area located just to the east of Malvern Link. The Malvern Hills are managed by a separate body the Malvern Hills Trust which was first established by Act of Parliament in the nineteenth century. Culture, heritage and nature come together in the Victorian historic water-cure town of Malvern. Modern day attractions in the Malverns include exploring the hills on foot, a number of local estates and stately homes that can be visited and a full program of cultural events at the renowned Malvern Theatres. Planning a visit therefore needs to include the medieval Malvern Priory, the magnificent Malvern Hills with their amazing collection of over 130 celebrated Springs and Wells and of course an evening at the theatre complex. In addition the Three Counties Showground offers activities and events throughout the year. Amongst the many other attractions, Malvern Museum is only a stones throw away from the Tourist Information Centre (TIC). The TIC is located in a splendid building in the town centre and can provide you with all that you need for a thoroughly enjoyable visit to this locality, noted for its scenery and culture. The M50 motorway provides the nearest vehicular link to the Malverns with its turn off to Upton on Severn. The M50 connects to the north-south M5 motorway. Great Malvern has an attractive Victorian railway station and the trains also stop at Malvern Link. The city of Birmingham with its international airport is about an hour away by car. The local Civic Society plays a key role in the development of the ethos of the Malverns, with its watchful eye on planning issues as well as the active program of events. It is entirely run by volunteers and is a registered charity. 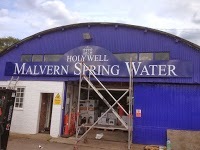 To find out more click Malvern Civic Society. In the pictures above, Edward Elgar the local composer of world renown observes the centre of town from Belle Vue Terrace together with other sequencing pictures illustrating the localities that come together to form Malvern, Worcestershire. Click website below to go to the Official Malvern Website for much more information for visitors. Click the Worldwide logo below to discover many more Malverns.